When the M23 rebel group seized the city of Goma in eastern Congo last November, a coalition of activists sprang into action. Activists began calling for a U.S. presidential envoy to work with leaders and stakeholders from the region to address the urgent security needs. At the center of this outpouring were the voices of hundreds of Congolese women leaders demanding attention to the impact on civilians of the rapidly advancing rebel movement. Fearing for their safety and the safety of their families, the leaders launched a petition on Change.org, supported by partners World Pulse and the Enough Project. Within weeks, the petition had spread across the globe, gaining over 100,000 signatures. The petition quickly drew public support from Nobel Peace Prize winner and Liberian peace activist Leymah Gbowee and actress and activist Robin Wright. With increasing international media attention, a harmonized activist movement, and the resolve of this small but powerful group of female leaders, the Enough Project and World Pulse decided to take this petition directly to the White House. 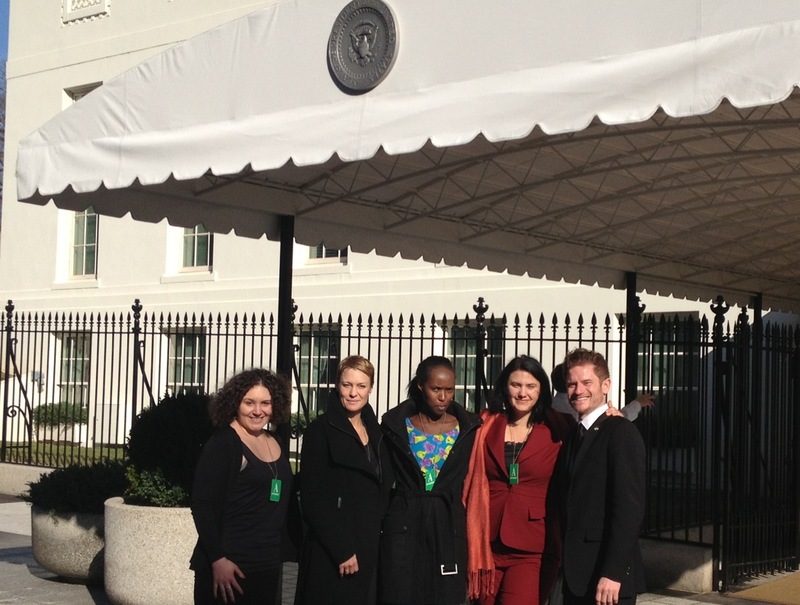 On January 29, Change.org’s Shelby Knox, Robin Wright, Congolese leader Adele Kibasumba, World Pulse's Jensine Larsen, and I—pictured at the doors of the West Wing—met with White House National Security Council leaders Grant Harris and Anna Cave, as well as Karen Richardson from the White House Office of Public Engagement. Kibasumba shared her personal story of fleeing from eastern Congo. She trembled as she spoke of the current threats facing her family in eastern Congo and her desire to return to a safe Congo. Kibasumba longs for the day she can return home and help rebuild her country. Both Harris and Cave thanked her for sharing her story and assured the activists that Kibasumba’s testimony and this global petition make a difference to direct attention at the dire situation in eastern Congo. The activists reinforced the demand of the petition: the appointment of a U.S. presidential envoy to address the set of complex regional challenges facing the people of eastern Congo. Yesterday, students from across the world called the White House to demand the appointment of a presidential envoy. People from Bukavu, across the United States, and in dozens of countries spoke up with one voice and one message. The time to appoint a U.S. presidential envoy is now. I have sat in many White House meetings, and this one was different. Adele’s powerful testimony, representing over 100,000 people in this petition, was heard loud and clear. Grant, Anna, and all of us were moved. We are compelled to act.